BFGoodrich is one of the best tire suppliers in the Motorsports business. There is no question about that. However, the new tire that BFG debuted with the Pro Cup cars this year has a lot of drivers scratching their heads, trying to get it figured out. There was a lot of head scratching going on Saturday as the Northern Division guys raced with the tire for the first time in 2005. However, St. Amant was quick to point out that BFG is a great company and that the complaints anyone might have about the tire has nothing to do with them. Even though he’s raced in all of the Southern Division races so far this year, Jay Fogleman is still trying to figure out the tires. Gary St. Amant had an uncharacteristically horrible race to open up the year at South Boston on Saturday night. “The weekend started off on the wrong foot on Friday morning when our hauler had fuel pump problems and we got the trailer and the race car to the track and didn’t have any way to open up the back gate to get the car out because of the way the truck was wired,” said St. Amant. “So that kind of put us behind and we never got caught up all weekend. “After we had wrecked and I knew I was going to be sitting in the pits for while replacing a radiator, I thought I would get out of the car and go find out what Jimmy Jr was thinking,” said St. Amant. “I stormed down pit road found the #36 pit box and went up, pretty much not as Gary St. Amant the person but as Gary St. Amant the racecar driver, and I pulled on a pants leg that was on top of the pit box and I just started screaming. I had a wrecked race car that I wasn’t happy about that and then that face looked down at me. It was Jimmy Spencer Sr. So St. Amant became a teacher. St. Amant's #11 didn't look this good by the end of the night. Following the wreck, St. Amant was not happy with Spencer Jr. As the team tried to make repairs to the #11 JEGS.com car, St. Amant took a walk to Spencer’s pit stall. The story that follows is classic. St. Amant knows that part of the problem is the pressure young drivers feel these days. 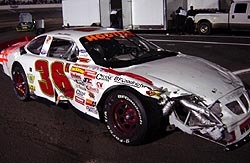 Jimmy Spencer Jr.'s car looked a little worse for wear when the night was over. “I feel we have these young kids that have to show they all have something to prove and when they get laps down, all they are thinking about is racing whoever is beside them. It doesn’t matter who is on the lead lap and who isn’t. drivers for Dean Motorsports in the Late Model Stock Car ranks around the Southeast. “The breaks would get real hot on short runs and at one point the car was real loose. This was a last minute deal, so I called a bunch of my friends who came out to help me in the pits with this deal. I don’t have a really good pit crew, they are friends who are helping out last minute and they do not have a lot of experience. “We went out to run laps. We didn’t have any real strategy out there. We just wanted to go and learn as much as we could. 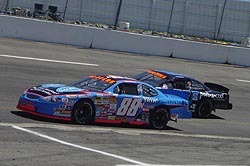 I was running second at one point in the race, but the brakes were just not right and I couldn’t touch the brake pedal. It was almost worthless. A name that not many in the Pro Cup world may know, but a name that South Boston fans know well is that of Woody Howard. On Saturday night, Howard made his first Pro Cup start, driving for Dean Motorsports. I qualified an impressive second, then stayed near the front all night long and finished seventh. Mart Nesbitt was having a stellar run on Saturday for 200 laps. 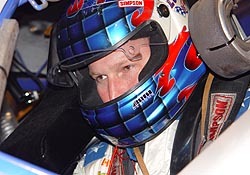 Nesbitt, who qualified sixth, raced his way into the top five late in the race and was attempting to pass Mardy Lindley for fourth when he clipped Jimmy Spencer Jr., igniting a multi-car crash. “It is just real tight racing and it is hard to get around people,” said Nesbitt. “I got up beside Mardy and we were wheel-to-wheel and unfortunately, I caught Spencer there on the backstretch. I was about to give up the position and follow him back into the corner to pass him, but some checked up and I wasn’t expecting it. Danny Sammons qualified 10th, but the New Jersey driver didn’t make much headway with the tight racing quarters of South Boston Speedway in the fist 75 laps. With track position a premium, Sammons elected to short pit on Lap 80. After the leaders cycled through pit stops, Sammons took the lead on Lap 102, held it for 40 laps and picked up $1,000 for being halfway leader. In the end, however, the strategy didn’t pay off. After Gordon took the top spot on Lap 142, Sammons was shuffled back to seventh and eventually caught up in a multi-car crash on Lap 208. Sammons finished 17th. "A lot of the guys weren’t patient out there tonight," said Jeff Agnew. "But South Boston is so tight and it’s so hard to pass, I think that’s why you saw a lot of impatience. You can’t blame it all on the drivers. That’s just what happens when you try to stick these big cars in hole that doesn’t fit." Joel Kauffman and Team L.A. Motorsports experienced the full range of emotions Saturday night. The evening couldn’t have started out any better, with Kauffman taking the first pole of the Northern Division season. 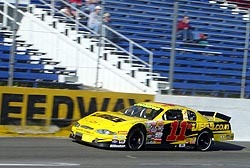 Kauffman proved that the qualifying run was no fluke, leading the first 100 laps. In a race slowed by numerous cautions, Kauffman managed to stay out of trouble and open up a lead on the rest of the field. The Northern Division drivers of the Hooters Pro Cup Series have been chomping at the bit to get the season started. After watching their Southern Division counterparts compete in three events, Saturday’s South Boston race was the first chance for the Northern Division to take center stage. Unfortunately, a third of them weren’t around at the finish after six multi-car accidents ended the nights of many contenders. The night got exciting for the L.A. West Pontiac when a jammed lug nut led to a slow pit stop, causing Kauffman to come out third. 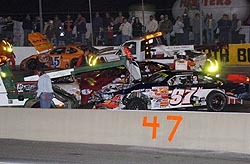 A car in the lead pack then missed a shift on a later restart, causing Kauffman to clip the car in front of him. 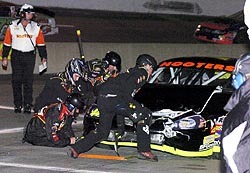 The Team L.A. Motorsports crew hung tough, using a couple of late pit stops to repair the damage without losing a lap. Kauffman battled through lap traffic and avoided accidents the rest of the night to get back into the top ten. car was so fast all night. Even at the end, we were running faster times than the leader. I’m really proud of the team for not giving up. A pole and a top-10 finish is a great way to start the season." 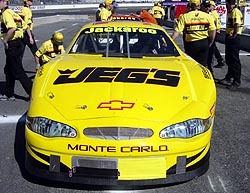 Johnny Rumley is looking forward to the second race of 2005 at Virginia’s Lonesome Pine Raceway. That’s because he knows he’s bound to improve on his performance in the Northern Division’s season-opener at South Boston. Rumley qualified 13th, but finished 23rd after an up-and-down night that ended behind the wall. "We struggled ever since we unloaded for Friday evening practice," said Rumley. "If it could go wrong, it went wrong. Hopefully we got all that bad stuff behind us and we can get better. “It felt like I was in 10 of the 11 yellow flags. I got hit from the nose. I got hit from the rear. We qualified poorly in 13th and that just set us up in a bad place to start, especially at South Boston. Involved in an early incident not of his making, Rumley was forced to pit. But the strategy seemed to play into his hands, he found himself running third as the rest of the leaders pitted. But the good fortune was short-lived. "A piece of duct work got messed up and the temperature rose to about 230, so we had to give up that position. Then somebody got messed up in front of us and slammed on the brakes and we got in the back of another car and got the radiator. "Benny Gordon had some bad races early in the season last year and came back, so it’ll be OK. We know some things we need to do to get better, and we will be better when we get to Lonesome Pine."